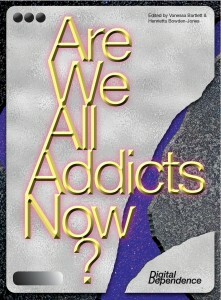 Are We All Addicts Now? Digital Dependence is an artist-led enquiry by Katriona Beales into digital hyper-connectivity and the normalization of addictive behaviours through our everyday interactions with digital devices. While internet addiction is not yet considered an official psychiatric disorder, it is gaining increased recognition as a behavioral phenomenon in both scientific study and the popular press. This project is the first interdisciplinary exploration of this burgeoning diagnostic territory. The book is designed by Stefan Schafer and combines visual and textual research, including artistic works from Katriona Beales and Fiona MacDonald : Feral Practice, alongside essays from contributors in the fields of anthropology, digital culture, psychology and philosophy. Informed by the latest scientific research, the book acknowledges the increasing difficulty many people experience in controlling their online habits. At the same time, it also thinks beyond the biological model of internet addiction toward the social and political dimensions that shape everyday online activities and habit-forming behaviour. This book is co-edited by curator Vanessa Bartlett and medical doctor and neuroscience researcher Henrietta Bowden-Jones. It is published to coincide with a major exhibition of new artwork by Katriona Beales at Furtherfield, London. Avaliable to pre-order now from Liverpool University Press website.